This is perhaps why Artic Monkeys treat proceedings with a sort of detached disdain. Secretly you can tell they are pleased with their brace of awards but, wary of who is watching, try to find a way of being both grateful and yet cool about it. 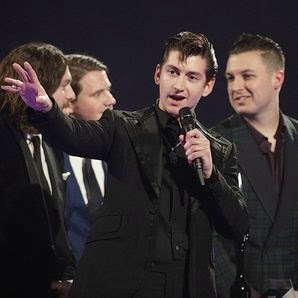 Alex Turner’s monologue about rock and roll seems like a dig at the dance, funk and solo singer acts that make up the majority of both nominees and performers tonight. Perhaps the Arctics baulk at being roped in with Bastille the only other nominal `rock` act here though that loosens the definition to a new breadth. Bastille sound like a combination of a dozen better acts put together in the laboratory in an attempt to find someone to fill the gap when Coldplay are resting. In fact they make Coldplay look like Led Zeppelin. The girls are better at this sort of thing. While some of the boys do their best to act like sulky teens, the girls behave like women. 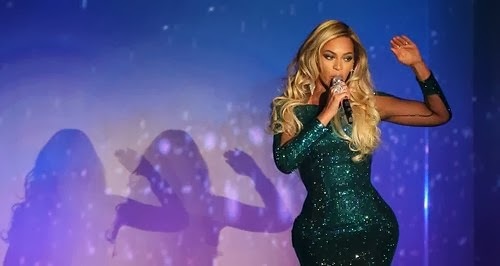 Beyonce eschews props and trickery to simply stand still and belt out `XO` in easily the best performance of the night. That said Ellie Goulding managed to shine amidst flames and drummers as she delivered `I Need Your Love` and `Burn` in the second best turn of the evening. The difference between Ellie Goulding’s powerful performance and nervous acceptance speech was notable. Both she and Lorde- whose appearance with Disclosure was another highlight – are emotionally involving singers who you imagine can turn their vocal chords to anything and still come out on top. Plus they both seem a little crazy which always helps. Compared to Katy Perry, who needs psychedelic Aztec costumes and dancers to make an impression they are in a different league. This sort of event seems to thrive on a certain conformity of behaviour so 2014’s Brits saw winners thank their management before anyone else, the return of live flames and drummers plus not much bad language except for host James Corden’s occasional mild expletives which older viewers might at one point have taken as him dissing Beyonce. Oh and green seems to be the colour of the year. Compared to the more theatre sized scale of past decades the modern Brit Awards are staged in the cavernous O2 Arena which as One Direction’s Harry Styles discovered means popping to the toilet leaves you miles from the stage. Presumably the serving staff had skates fitted so they could get round all the tables though on some it looked as if a mountain of champagne had been deposited ensuring everyone was well watered. "And David also asks if you can pick up some sprouts from Tesco"
There was no shortage of stars in the house with the likes of Prince (Prince!! ), Noel Gallagher, Emile Sande and Kylie presenting awards yet it was an absentee who made the biggest impression. David Bowie was never going to turn up to accept his Best British Male Artist award but once again demonstrating his mastery of the unexpected he’s sent Kate Moss, sporting a 1970s Ziggy costume, with a short speech in which he managed to weigh in on the Scotland independence debate. The result? One of the quotes of the night, headlines afterwards. He could only have made a bigger impression by actually showing up. I think we’d all like to see a duet between Bowie and Lorde sometime though.. The feeling is that given the strictures of Awards as mentioned earlier, this year at least dished them out to worthy recipients on the whole though you could make a case for London Grammar or Disclosure getting the Breakthrough Act ahead of Bastille. One Direction’s two awards being sales and public vote orientated, Ellie Goulding’s Best Female Artist suggesting the industry sees her as the new Annie Lennox, though hopefully she’ll take a different path, and wins for Rudimental, Katy Perry, Sam Smith and Arctic Monkeys showing a degree of eclecticism not always seen at the Brits. The live performance were colourful (flames, bright colours, good sound) rather than offering anything truly bonkers while James Corden’s breezy hosting works in this environment. They’ll probably get Nick Grimshaw to do it next year. However many platforms there are in varied formats to listen to music or watch promo videos, something like the Brits remains a valuable showcase for a cross section of contemporary music artists. Yes there are anomalies but as a show the Brits dishes up enough stars to dazzle us for a couple of hours.